My family is just nuts over mangoes. The have a sweet/tart flavor that we learned to love while on vacation in Mexico many years ago. Needless to say when a friend gave me a container of mango puree that had to be used that day, I jumped at the change to make something special. 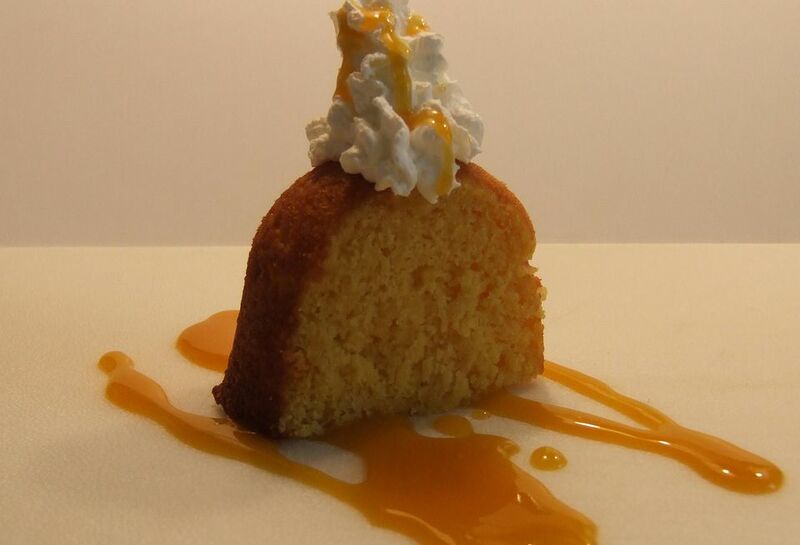 I came up with this recipe for Mango Bundt Cake with Mango Sauce. It's amazing how extremely moist and light the cake came out. I could have made a glaze with the remaining puree, but a warm sauce turned-out to be the much better choice. If you don't happen to have any mango puree, it's simple enough to make your own. Just peel and seed 3 really ripe mangoes. Puree the pulp in your food processor. Measure out the 2 cups of puree for the sauce first. Measure the remaining puree for the cake. If there isn't a full cup add water. If there's more, add to sauce. Grease and flour the Bundt cake pan. Combine the cake mix, eggs, oil and 1 cup of the puree in a mixing bowl. Mix it until moistened and then beat it for at least 2 more minutes. Bake the Bundt cake for 39 minutes. Cool it the pan for 10 minutes on wire rack. Carefully remove the cake from the pan and finish cooling it in the same wire rack. Before serving the cake, add the leftover 2 cups of mango puree, sugar and cornstarch to a medium-sized sauce pot. Stir the mixture together with a wire whisk. Over medium heat, heat the sauce until thick and bubbly. Stir often to keep it from burning. Remove it from the burner for serving. Place a piece of cake on a plate. Ladle the piece of mango cake with the warm sauce. To complete the dessert add a dollop of freshly whipped cream. Or you could just place a slice of cake on each plate and let your family or guests add the sauce and whipped cream. Merry Berry Parfait is a healthy dessert that just about anyone will enjoy. Mango Pie is creamy pie similar to a Key Lime Pie only it’s made with mangoes. Tangy Mango Mouse is like a cream pie, but without the crust.